The news comes on the heels of the hospital's June 29 move into its new state-of the-art building, the Ronald Reagan UCLA Medical Center. The 19th annual "America's Best Hospitals" guide highlights U.S. News & World Report's July 21 edition. The rankings are also available online at www.usnews.com/besthospitals. The magazine put 5,453 medical centers through an intensive screening process to create the 16 specialty rankings in the 2008 edition of the survey. Just 170 hospitals made it into the rankings, and only 19 entered the honor roll. The honor roll recognizes hospitals that demonstrate excellence across many specialties. "This is a wonderful tribute to our entire health care team as we celebrate the opening of our beautiful new Ronald Reagan UCLA Medical Center," said Dr. David Feinberg, chief executive officer and interim associate vice chancellor of the UCLA Hospital System. "We are grateful to our medical staff, who go the extra mile every day to save lives and deliver compassionate care to patients in our community and from around the world." Hospitals are ranked in 16 specialties, from cancer and heart disease to neurosurgery and urology. In 12 of the 16 specialties, ranked hospitals must meet standards that are driven primarily by hard data. The rankings also include a reputation survey among randomly selected American Medical Association physicians, mortality data and quality-of-care measures, such as the relative availability of nurses, advanced technology and professional credentialing. "To once again be in the company of the nation's best hospitals - when rapid changes in health care constantly challenge our commitment to excellence - makes us extraordinarily proud of our dedicated physicians, scientists, nurses and staff throughout the UCLA Health," said Dr. Gerald S. Levey, UCLA vice chancellor for medical services and dean of the David Geffen School of Medicine at UCLA. "We congratulate each and every one of them for helping UCLA earn this well-deserved distinction." UCLA Medical Center was rated one of the top three hospitals in the nation, along with Johns Hopkins Hospital in Baltimore, which ranked first, and the Mayo Clinic in Rochester, Minn., which was second. Nationally, UCLA ranked in the top 20 in 14 of the 16 specialty areas. 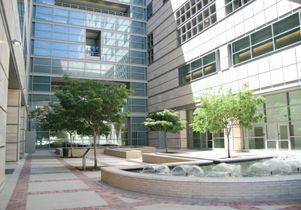 In each of the following specialties, UCLA ranked best in the western United States (UCLA's national rankings are indicated): digestive disorders (5); ear, nose and throat (9); geriatrics (1); kidney disease (7); ophthalmology at UCLA's Jules Stein Eye Institute (5); orthopedics (16); psychiatry at the Resnick Neuropsychiatric Hospital at UCLA (5); rheumatology (5); and urology (4). Other specialties in which UCLA ranked in the top 20 nationally were: cancer at UCLA's Jonsson Cancer Center (10); endocrinology (12); gynecology (10); heart and heart surgery (10); neurology and neurosurgery (7); and respiratory disorders (17). "The 'America's Best Hospitals' rankings provide readers with trusted material during one of life's most concerning times - hospitalization," said Brian Kelly, editor of U.S. News & World Report. "Our rankings highlight the internal culture of excellence embraced by caregivers in the great hospitals throughout the United States." Designed by world-renowned architects I.M. Pei and C.C. 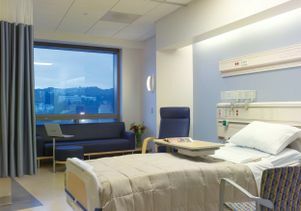 Pei and leading international health care designer Perkins+Will, the 520-bed Ronald Reagan UCLA Medical Center blends the latest in medical technology with an emphasis on natural light and calming spaces to enhance patient healing. The nonprofit, self-supporting hospital is the primary teaching hospital of the David Geffen School of Medicine at UCLA and is one of the first total-replacement hospitals to be built in accordance with California's latest seismic safety requirements. The new medical center also houses the 90-bed UCLA Mattel Children's Hospital and the Resnick Neuropsychiatric Hospital at UCLA, a separately licensed 70-bed facility. For information about clinical programs or help in choosing a personal physician, call (800) UCLA-MD1 or visit www.uclahealth.org.